Bird Island is a small barrier island adjacent to the coastal resort town of Sunset Beach, North Carolina. 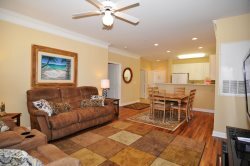 A perfect sanctuary of white sandy beaches, high natural dunes, salt marshes and tidal creeks. A remote beach, where many bare their naked souls and rumour has it, their naked bodies. Thousands of anonymous travellers have made pilgrimage to Bird Island, some crossing forceful waters, others walking on the low tide and many stranded, all drawn by once blank pages now filled with the thoughts and fears, hopes and dreams, poems and prayers of complete strangers, beautifully united. The ocean breeze invites you on a 1.4 mile walk from Sunset Beach to the Pier at Bird Island. As you approach an American Flag blowing in the wind, there tucked high in the sand dunes on this quiet haven lies a solitary and weathered mailbox, Kindred Spirit painted on its side. A symbol of hope held only by a wooden post, where many have sat on the roughhewn driftwood bench, gazing out over the ocean and read others stories and shared their own, searching their souls and purging their thoughts. Kindred Spirit holds journals, pens and many deep secrets. An open dialogue that opens hearts. Be remembered or remain unknown sharing your secrets anonymously. Once blank pages now filled with stories of love, loss, reflection, regret and triumph showing us we are not alone in this world. Some express simple appreciation for the serene beauty of the unspoiled wilderness that surrounds them, others share emotions of overwhelming grief or feelings of young love. Letters of gratitude, pleas of surrender, apologies, forgiveness and redemption now fill the once blank pages. Many hands, all from different walks of life, some in foreign languages have penned heartfelt notes in these journals. Some barely legible, others lengthy and many pure simple words such as “Love Endures”, a message that opens hearts to all who have visited. Messages of hope and sonograms showing new life fill these pages. Who is this Kindred Spirit that collects others thoughts, lovingly reads each one of them and stores them safely for others to share. Who placed this mailbox here and why? Frank Nesmith, known to some as the Island’s Keeper, shares the story of his girlfriend Claudia, who saw a mirage of a mailbox on the shores during low tide and followed her vision. In 1981 she placed a mailbox with envelopes and stamps on some sand on Tubbs Inlet with a vision to encourage visitors to write to the Kindred Spirits, and they did. 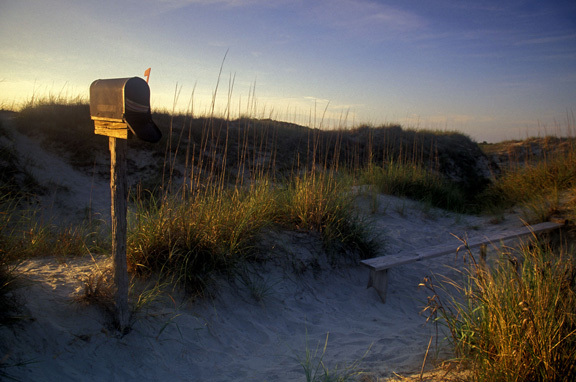 In 1983, the little island washed away and the mailbox was moved to Bird Island and has since become a cultural symbol and landmark on the beautiful coastal North Carolina. Handwritten pleas in the journals saved the island from resort development and in 2002 Bird Island became a coastal reserve. Kindred Spirit today lives on in the loving care of local author Jacqueline DeGroot and Frank Nesmith. Each journal and letter, valued treasures of the sea, are lovingly read, carefully preserved and form part of a special collection at University of North Carolina Wilmington for public viewing.